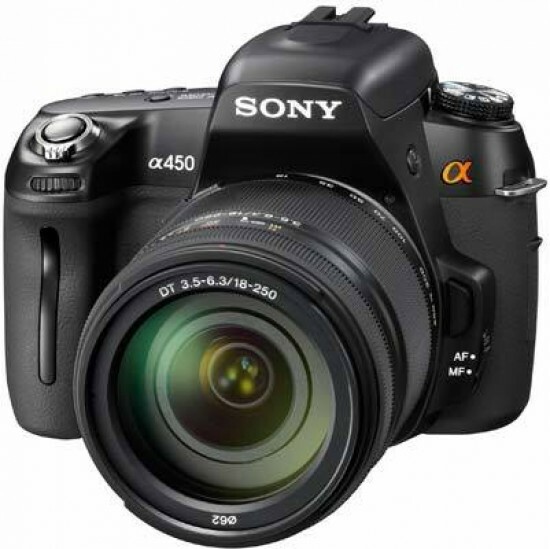 The Sony A450 is a mid-range 14.2 megapixel DSLR camera offering advanced Auto HDR functionality and high-speed continuous shooting capabilities. Slotting in above the A3- series cameras and below the A700, the Sony Alpha A450 employs an Exmor CMOS sensor for better low-light images with an increased ISO range of 200-12800. The A450 offers a class-leading 7fps continuous shooting rate, while the Auto HDR mode promises to capture a huge range of shadow and highlight detail in landscapes, interiors and other scenes. The Manual Focus Check Live View mode assists with fine-tuning your composition and focus, while a 9-point AF Sensor with eye-start auto-focus, SteadyShot anti-shake system, built-in dust reduction, a pop-up flash and up to 1050 shot battery life complete the A450's headline specs. 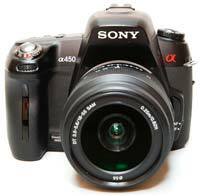 The Sony A450 is only available in Europe and costs £529. 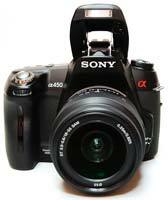 The Sony A450 is positioned as a cheaper alternative to the higher-end A5- series of Sony DSLR cameras, with the more expensive A500 and A550 models sitting above it in the now extensive range of Alpha DSLRs. Those two cameras benefit from Sony's excellent Quick AF Live View system and larger tilt and flip LCD screen, with the A450 instead only offering Manual Focus Check Live View and a smaller fixed 2.7 inch LCD. Unlike the two two cameras directly below it, the A330 and A380, which featured a complete design overhaul with smaller, lighter plastic body and uncomfortable handgrip, the A450 is bigger, better built (although still made of plastic) and has a much more pronounced handgrip that markedly improves the handling, particularly if you have medium-to-large hands. I much preferred using the A450 compared to the A330/A380, predominantly because of the chunkier handgrip. Another side-effect of utilising a slightly bigger body is that the A450 doesn't suffer from having too few controls, one of our other main criticisms of the A330/A380. Whereas Sony's designers had to re-think the control layout and philosophy of those cameras and reduce the number of external controls so much that they became less intuitive to use, the A450 reinstates some key controls, making it much easier to operate. The separate Drive Mode, ISO and Display buttons are back, no longer mapped onto the four-way controller, which can now function once again as the quick AF point selector in the Local AF area mode. You can also choose Wide to let the camera choose the most appropriate AF point from the 9 choices, or use the central AF sensor and recompose if needed. This age-old focus-recompose technique is much faster than selecting an off-centre focus point on the Sony A450, and works every time except when dealing with extremely shallow depth of field. Alternatively, you can use the AF button in the centre of the four-way navigation pad to focus on whatever is in the centre of the frame, and hold it down not only while recomposing but also while releasing the shutter too (so that pressing the shutter button does not cause the camera to refocus). The AEL (autoexposure lock) button is also back, logically positioned for operation with your right thumb. Of probably less importance is the omission of the SteadyShot switch - the A450 retains the sensor-shift image stabilisation feature, but now you need to enter the main shooting menu to activate or deactivate it. Given that about the only time you will want to deactivate it is when you mount the camera on a tripod, the omission of an external switch for this particular function seems a logical decision. The power switch is back in a logical place surrounding the shutter release button, and the control wheel falls naturally under your right forefinger. All of these small changes add up to make the A450 a much more enjoyable camera from a handling point of view than the cheaper A330 / A380 models and puts it on a par with the more expensive A500 / A550 models. 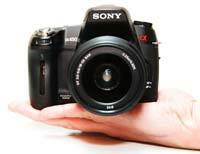 The optical viewfinder (OVF) of the Sony A450 delivers 0.83x magnification and 95% frame coverage. The nine autofocus points are permanently marked on the focusing screen, and are therefore always visible in the viewfinder. The active AF point lights up in red when in use, and if focus is acquired, a green focus confirmation dot appears on the left side of the in-finder LCD, similar to other manufacturers' models. 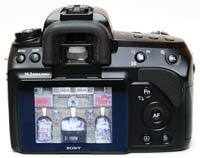 The LCD screen is a fixed 2.7-inch, 230,400-dot affair just like the one in the A230. The brightness of the screen can be set manually, but it can also adapt to ambient light levels automatically. Outdoors visibility is average - we've seen much worse (more reflective) LCDs on some competitors, but would still like to see some improvement to the antiglare coating. The A450's Live View mode provides the ability to magnify into the live image for accurate manual focusing in macro and tripod shooting. Simply press the MF Check Liveview button when in Live View mode to allow critical assessment of focus and fine detail. The live image in this mode offers an improved 100% field coverage, assisted by framing grid lines for precise composition, and you can also select the 7x/14x zoom function for close-up confirmation of focus by using the AEL button. The Sony A450 has a pop-up flash with a guide number of 12 (in metres at ISO 100). There is a mechanical button to raise the flash or you can raise it manually by hand. 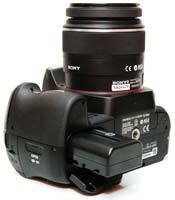 The pop-up flash can also act as a TTL controller for wirelessly slaved external flash units. External flashguns can of course also be mounted to the camera itself via the hot shoe. Be reminded that it is not of the standard variety - non-dedicated flashguns and other hotshoe-mounted accessories such as PocketWizards physically cannot be mounted without a separately sold hot shoe adapter. The Sony A450 offers the sensor-shift image stabilisation system we already touched upon which Sony now calls SteadyShot Inside. This works very well for providing camera stabilisation at relatively slow shutter speeds - see a demonstration in the Image Quality section of this review - but it's less effective at the other function Sony has tasked it with; namely, shaking off any dust particles that may have settled on the sensor during a lens change. Apparently the anti-shake system was simply not designed to move the sensor fast enough to shake off the dust - Sony really need to make some improvements here. Other long-standing Sony DSLR technologies present on the A450 include a pair of eye proximity sensors beneath the viewfinder that automatically shut down the LCD when raising the camera to your eye (provided you are not in Live View mode), and Minolta's legacy Eye-start AF technology. In the field, I found the eye-start autofocus system to be somewhat useful, though not necessarily faster than the more traditional solutions. The innovative help guide display is a useful tool which teaches beginners about the effects of aperture and shutter speed, both by way of a text guide and via icons such as stick figures. This approach is certainly better than simply throwing in an auto mode and a host of scene modes (which is not to say the A450 lacks any of these, but the inclusion of the help guide does mean it goes a step further). 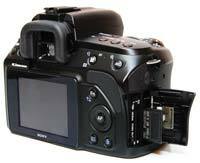 The Sony A450 has slots for SD/SDHC and Memory Stick PRO Duo memory cards. Dual card slots are always welcome, though the A450 unfortunately has one of the least useful implementations of the concept I have seen to date. The camera cannot record simultaneously on both cards, cannot copy images from one to the other, and cannot even switch automatically to the second card when the first one fills up. To do that, you need to open the sliding cover that hides the memory card compartment and manually move a small mechanical switch to the desired position. The USB and HDMI OUT ports are located on the left side of the camera along with a port for the optional Remote Cable for hands-free operation of the shutter release. Battery life is just over1,000 shots if exclusively using the optical view finder, or 500 shots for the Live View mode, both very impressive for this class of camera. In use, the Sony A450 proved to be pleasingly quick. Start-up was nearly instant, autofocus with the kit lens was fairly speedy if not quite as quiet as with an SSM lens. The camera's burst mode is an impressive 7 frames per second (fps) with the OVF, and 4fps in Live View. The latter value, though lower than the former, is actually much better than anything the competition's DSLRs can produce in Live View. Image playback speeds were also acceptable. Magnifying into an already captured image does take a couple of seconds though. Maximum image magnification is 12x, but there is little point in going beyond the default 6.1x setting as the image progressively falls apart at higher values.